Thanks Adam, Allison, and Lucy! Professional and compassionate staff are integral to a well run department. In this regard Geography is fortunate. Adam Ware leads a staff that is competent, dependable, efficient, and punctual; attentive to detail and sympathetic in their approach. They are great at resolving conflicts and handling tough situations with patience and tact. They bring joy to the office. Our new tidy look is the reflection of this joy. Thank you Adam, Allison, and Lucy! Graduate student training is essential to the mission of Florida State University. It has been my passion since I arrived on campus in 1990. My approach is simple; be respectful, be available, and demand excellence. I am respectful at all times. There is no substitute for a healthy relationship between myself and my graduate students. A healthy relationship begins and ends with respect. I take an active interest in my students and in their future. I try to be organized so I can provide them with bespoke training giving them opportunities specific to their individual goals. This means I train for both academia and industry. Kelsey Ellis (Scheitlin) is now an associate professor at the University of Tennessee in Knoxville and Holly Widen is now a research associate at Risk Management Solutions (the world’s leading catastrophe risk modeling company). I provide a supportive environment for research and scholarship through a consistent open line of communication. I’m available electronically even when I’m away from my office. I listen. Listening sends the message that I value them as individuals and take their ideas seriously. I let them know where they stand and what the strengths and weaknesses of their work are. I give immediate and honest feedback. Persistence and inspiring support can overcome what I might initially interpret as a lack of ability or motivation. I provide opportunities to present research at national conferences and opportunities to collaborate with other scholars outside the university. I spend time with my students outside the classroom. I chase tornadoes with them and take them on damage surveys. I demand excellence. I teach them how to be careful readers, clear writers, clean coders, and compelling communicators. I show them by example. I challenge them toward professionalism. I emphasize that a computer code that solves a problem is the start. The code must be understandable to others and to them a few years hence. I teach them that if a careful analysis is to be convincing, the trail from the data to the final output must be made clearly available. A scientific paper is an advertisement for a specific claim but proof is the procedure that produced the result. Thus I teach them how to be methodical and meticulous with the visual display of information. The reward is the deep and lasting satisfaction that comes with knowing I’ve made a difference in their lives. The 2018 hurricane season will be long remembered by us in North Florida. Back in May I predicted an average season with a high likelihood of at least one hurricane seriously impacting the United States (see earlier blog), though I had little idea it would strike with such ferocity so close to home. As it turned out fifteen tropical storms formed with eight of them going on to become hurricanes. The two most devastating–Florence and Michael–reached major hurricane intensity. Hurricane Florence made landfall in North Carolina dumping historic amounts of rain. Hurricane Michael reached the coast as the strongest hurricane ever recorded in the Panhandle, packing winds to nearly category five status. Residents from Panama City to St. George Island and inland to Marianna are still cleaning up. Memorable indeed. Based on records kept at the National Hurricane Center, Hurricane Michael was the third-most intense Atlantic hurricane to make landfall in the contiguous United States in terms of pressure, behind only the 1935 Labor Day hurricane and Hurricane Camille of 1969. It was the strongest Atlantic hurricane to form in the month of October since Hurricane Wilma back in 2005. It was also the strongest storm in terms of maximum sustained wind speed to strike the contiguous United States since Andrew in 1992. It was also the fourth-strongest landfalling hurricane, in terms of wind speed. According to official records, Hurricane Michael caused at least 60 deaths including 45 in the United States and 15 in Central America. Michael also caused upward of $14 billion in damages and an unspecified amount of damage to the infrastructure at Tyndall Air Force Base. According to the reinsurance industry, property insurance claims in the United States will likely exceed $5 billion and losses to agriculture and timber could exceed $6 billion. There isn’t one best way to measure the strength of a hurricane season but folks at the National Hurricane Center use accumulated cyclone energy, or ACE, which considers not only how fast the winds are blowing but for how long they blow. Stronger storms like Florence and Michael that last long contribute much more to ACE than weaker, shorter lived storms like Alberto (which also made landfall in the eastern Panhandle during May). The hurricane season finished with an above-average value for ACE. My research shows that the strongest hurricanes like Michael are getting stronger as the ocean warms (see earlier blog) but most storms encounter conditions that limit opportunities for growth. Michael went through a prolonged period of intensification and we anticipate that these periods of intensification will get longer as the warmest waters expand in coverage due to anthropogenic climate change. Let’s all hope for better luck next season, but I won’t bet on it. Like all departments Geography relies heavily on professional staff. We have two full-time positions a budget manager and an academic specialist. These staff positions are critical to a smooth running department with 200 majors, 67 graduate students, 10 adjuncts, and 15 faculty. From ensuring everyone is paid on time to advising students on what courses they need to graduate, the staff work load is substantial and the stress can be high. We’ve been lucky with some excellent recruits, including our new budget manager Adam Ware, but as evidenced by the recent departure of Alex Cohn, staff salary appears to be insufficient for the amount of work these folks do for us. The university has made a significant effort to improve faculty salaries but it’s time they make a similar investment in staff salaries. This investment will help FSU reach it’s goal of becoming one of the country’s Top 25 public universities by giving faculty and students reliable, efficient, and consistent staff support. Ask questions that interest you, not ones other people think are most important. Learn to write in short time intervals (e.g., half hour). Often that is all you get. Transcribe word for word a well-written paper. Maybe one from your advisor. I trust you had an enjoyable summer. I got to play Ultimate (frisbee) with the Bulgarian team! We’ve been busy remodeling the front office. Thanks to the hard work of Adam and Petya it looks great. Once again you’ll be able to enjoy daily coffee (and the occasional doughnut). This year the department will have 15 full time tenured or tenure-earning faculty. This is a peak that was reached only once previously (briefly in 2008). We welcome seven new doctoral students, one new master student, and 17 MSGIS students. We have a great lineup of speakers for our colloquium series this semester. Please check the website for updates. Petya is on a short leave and will return September 18th. I wish you all the best this academic year. I do lots of coding. Mostly for analysis and modeling of climate data. This requires keeping track of many files. Data files, code files, figures, reports, presentations, etc. Even for a single project the number of files tends to be 20 or more. And the files change as the project evolves. Tools like Google docs and Dropbox help me work from wherever I am but they don’t help me manage the project. This is important especially when working with my students and other collaborators. Distributed version control is the answer. Git is a popular version control software and GitHub is a widely used solution for it’s distribution. Unlike an app for your phone, getting Git/GitHub to work can be challenging especially if you have well-worn tracks in how you get things done. Fortunately there are folks writing great tutorials on how to overcome the initial challenges. I highly recommend the tutorials by Jennifer Bryan a software engineer at RStudio and a professor of statistics at the University of British Columbia. She has done a fabulous job of providing guidance to help you get started. Links: https://peerj.com/preprints/3159/, http://happygitwithr.com/. Get Git’ing. Getting around Sofia is easy. No car, no problem. Hop on one of the many buses, trolleys, trams, trains (metro); Sofia has them all. The network is vast. Signs tell you how long you will need to wait (generally less than 10 minutes). When getting from point A to B, trip apps like Moovit tell you exact what line to take (and when). It’s also affordable — a single metro ride costs about $0.84, buses, trolleys, and trams are even cheaper. I paid $36 dollars for a 30-day card good on all lines and transferrable to friends or family. I rode them all. It’s standing room only during commute time but most of the buses are now air conditioned. A bus ride (604) from Hotel Pliska to the Palace of Culture, a stroll down Vitosha street to Serdika, a metro train back. Easy, safe, friendly. So Sofia. I’m the tournament director for the U.S. Open Overall Frisbee Tournament to be held next week here in Tallahassee. The tournament combines seven frisbee events (accuracy, distance, golf, etc) to determine who is the best frisbee master. There are divisions for open, women, and juniors. There are over 20 players from all over the U.S. competing. The tournament is sponsored by Visit Tallahassee. Finals will be Saturday, June 16th starting at 10a at Tom Brown Park (near the dog park). All the details are available on this cheat sheet. Come out and watch! What Can We Expect From This Year's Hurricane Season? Weather forecasts give us a good idea on whether a hurricane brewing in the Gulf of Mexico will come our way and how strong it might be when it gets here but they can’t tell us what kind of season lies ahead. For this we must rely on past patterns. One pattern is called ENSO; short for El Nino-Southern Oscillation. When ENSO is in its cold phase (colder than average ocean temperatures across the equatorial eastern Pacific Ocean) like it was last year, the environment over the Atlantic Ocean is favorable for hurricanes to form. Another pattern is the warming ocean associated with increased greenhouse gases. While a warm ocean does not a hurricane make, given a hurricane over sufficiently warm waters it is likely to get stronger. A third pattern is related to the steering currents. While not important for the number of hurricanes as a whole, they do tell us the chances one (or more) will visit Florida. So what about this year? ENSO will be in between a cold and warm phase so I predict an average number of hurricanes (6 or 7). While ocean temperatures continue to increase in the longterm, this year they are not likely to be particularly hot (like they were last year) so I expect 2 or 3 major hurricanes (category 3 or above). Finally, the steering currents appear to be somewhat favorable for hurricanes (outside the Gulf of Mexico) to curve away from Florida. While this might seem like good news, the level of predictability using these patterns is modest at best. In fact, the statistical models that I’ve developed [in collaboration with Carl Schmertmann (Economics)] show us that the forecast skill is limited to about 30% of the year-to-year variation. Bottom line: Pay attention to the weather forecasts and have a plan if one approaches. Adjunct professor of geography Dr. George Coles uses LiDAR technology to map the past. He mapped features of the paleo-channels of the nearby Aucilla and Econfina Rivers and identified a mound along the Econfina channel that is “very close” to a Native American shell midden, a pile of the shell and bone remains of prehistoric dinners. This story about Dr. Coles research is featured in the May/June 2018 issue of the Tallahassee Magazine. Read all about it here. The American Association of Geographers will be holding their annual meeting next month in New Orleans. The breadth of topics at this annual event is always impressive. This year’s themes include Black Geographies, Hazards and GIScience, and Public Engagement; areas of emphasis at FSU. Our department will be well represented with many of our faculty and students attending and giving talks. It promises to be a great meeting. I hope to see you there! March 22 is Ms. Audrey Nichols last day as the Department’s Office Manager. She will take time off from work to spend with her son Walter and her new baby daughter (Audrey June). Audrey served the faculty, students, and staff of Geography with skill, resourcefulness and attention to detail since the Summer of 2014. I am extremely grateful for her service. She will be missed. I wish her all the best and look forward to seeing her and her new baby soon! Last month I asked our Academic Specialist Alex Cohn to pull some demographic data on our students. In particular I’m interested in trends in diversity of our student body both undergraduates and graduates. There is much to digest but here are graphs showing the percentage of non-whites (self identified) for graduate and undergraduates and for graduate students only. The picture is optimistic but we can do better. I talked with Drs. Mesev and Horner about steps forward (diversity plan) and we agreed that offering courses that will attract a broader range of students and advertising to our current students the existing diversity of our faculty across race, gender, and scholarly interests will help us keep these trends going upward. Last week my faculty let the Dean know what they think about my performance as chair. The assessment was generally positive and constructive. Overall they think I’m doing well. That makes me feel good. I believe in my faculty and in what we are doing. Moving forward I’m committed to giving them the resources to be successful academics and to model the way for them to become the leaders of tomorrow at Florida State University and beyond. When I started as chair three years ago, my goal was for the department to become more diverse and inclusive. Today we have a wonderful group of energetic young faculty (with three more on the way next year!) and graduate students with a range of backgrounds and experiences. So it’s a pleasure to come to work every day and spend time working to promote and improve what we do as a diverse and inclusive department. A goal for next term is to foster more collaborative research. Faculty and students alike will benefit from working with scholars across the physical and human sides of the discipline. My own research on the tornado hazard will link the physics of casualties with the narratives of people in place. To paraphrase Gary Morson & Morton Schapiro (Cents & Sensibility), I believe geography can supplement the quantitative rigor, the focus on policy, and the logics of the environment, economy and health with the empathy, judgement and wisdom that defines the humanities at their best. We have the right people at the right time. Let’s make it happen. Over the holidays I took a look at how we’ve been doing as a department over the past five years. There are many ways to do this but I thought it would be instructive to quantify our productivity relative to the 100 or so geography departments in the country. The central message is that, although we are a relatively small department, we are writing lots of papers and these papers are receiving good attention. Happy New Year and keep up the great work. The procedure I used and the output are explained through the following R code. Input data from latest release. Sort queries for last academic year. Input data from earlier years. While no evidence exists that there will be more (or fewer) hurricanes or more hurricanes hitting our coasts, there is theoretical and statistical evidence that the strongest hurricanes are getting stronger as the oceans heat up due to global warming from the emission of greenhouse gases. The Atlantic ocean was very warm this year contributing to the duration and extent of storm intensification of the strongest hurricanes. The strength and position of the Bermuda High steered the hurricanes toward the United States. What might happen to hurricanes in the future as the climate warms continues to be an active area of research. Over the past decade, however, scientists have begun to uncover clues as to the kinds of changes that are already occurring. The theory of maximum potential intensity, which relates intensity to ocean heat, refers to a theoretical upper limit of hurricane strength given the proper environment [Emanuel 1988]. The upward trend is clearly seen by relating the wind speed inside a hurricane to a measure of the underlying ocean temperature. This relationship using hurricanes that have occurred across the Atlantic ocean [Elsner, Trepanier, Strazzo, and Jagger 2012] is shown in Figure 1. Across regions where the ocean is colder, the fastest winds (limiting intensity) are weaker. In contrast, in regions where the ocean is warmer the fastest winds are much stronger. This relationship (sensitivity of limiting hurricane intensity to ocean warmth) is quantified as the slope of the best-fit line, which amounts to 8 (+/-1.2) m/s/K. Current climate models fail to reproduce this sensitivity indicating results from them about what hurricanes might be like in the future are unreliable [Strazzo, Elsner, Trepanier, and Emanuel 2013]. Figure 1. Scatter plot of the fastest hurricane winds versus ocean temperature. The fastest winds are based on a limiting intensity model for the peak strength of hurricanes occurring over twenty grid cells across the North Atlantic. The best-fit regression line is shown in blue and the 95% uncertainty band about the line is shown in gray. Vertical bars contain the 80% of the estimates based on a bootstrap re-sampling algorithm [From Elsner et al. 2012]. The sensitivity of hurricane intensity to ocean temperature suggests that stronger hurricanes are likely as the ocean warms. This is indeed happening. 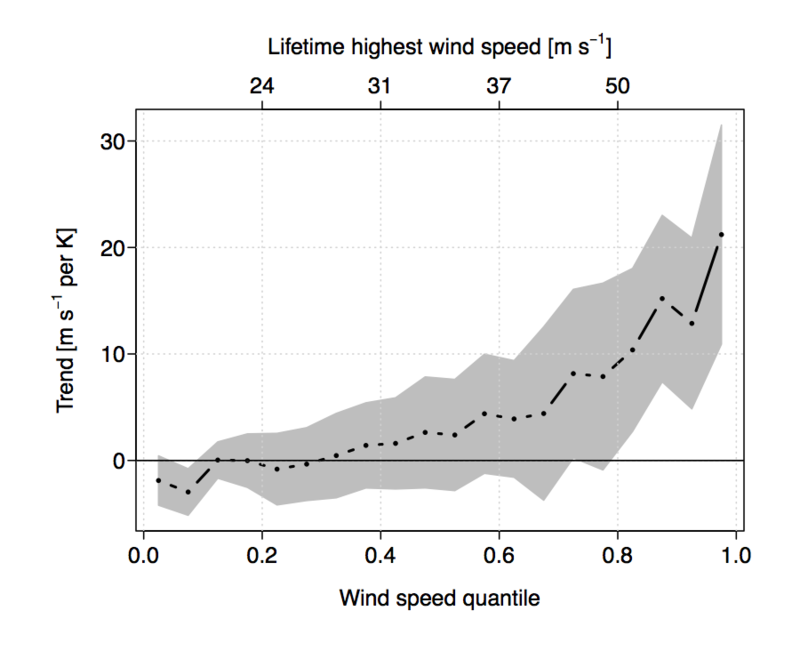 For each hurricane we record its lifetime highest wind speed, then look at the relationship between these fastest winds and ocean temperature [Elsner, Kossin, and Jagger 2008]. Figure 2 shows this relationship as regression trends that increase with increasingly strong hurricanes. Since El Nino also plays a role in modulating Atlantic hurricanes, a variable that tracks its monthly changes is included in the regression [Elsner and Jagger 2013]. At lower quantiles (weaker winds) the trend line is near zero but at higher quantiles (stronger winds) there is an upward trend (greater sensitivity of intensity to ocean heat). Hurricanes are not always in ideal environments for strengthening, but when the strongest ones are they are sensitive to warming oceans as dictated by theory. Figure 2. Trends in life time fastest winds. 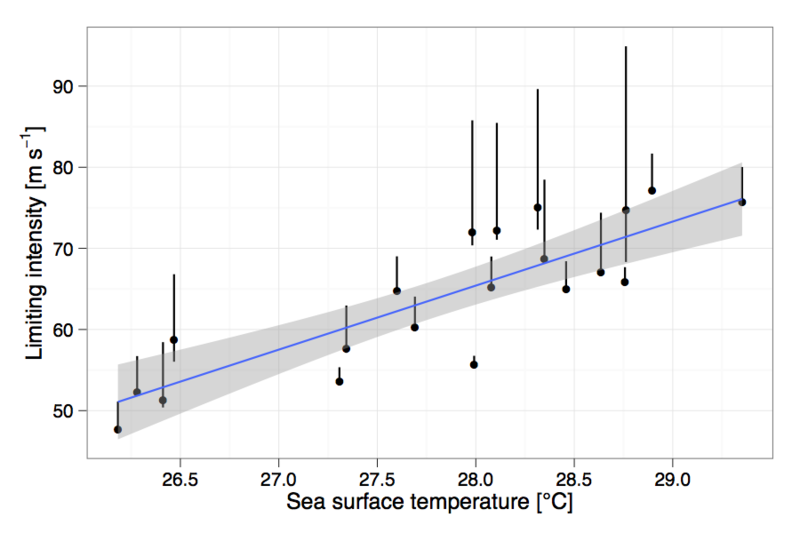 Coefficient of the sea-surface temperature term of a quantile regression of life time maximum wind speed for Atlantic hurricanes controlling for El Ni~no through the Southern Oscillation Index (SOI) [From Elsner and Jagger 2013]. The theory is silent about the number of hurricanes and indeed there is no significant upward or downward trend in Atlantic hurricane frequency since accurate record keeping has been in place. So metrics that are influenced by the hurricane frequency, like Accumulated Cyclone Energy (ACE) used widely by the National Oceanic and Atmospheric Administration (NOAA), are problematic for examining climate change effects. Some scientists have suggested that this upward trend in hurricane energy is part of the natural variability in the Atlantic known as the Atlantic Multidecadal Oscillation (AMO) rather than global warming [Goldenberg et al. 2001]. A test of these two competing hypothesis suggests that global warming causes the AMO since it is found that preceding values of global temperature predict the AMO and not conversely [Elsner 2007]. Others have noted hurricane property losses have not gone up recently and the numbers of hurricanes hitting the United States have declined over the past century and a half. Historically, however, when a hurricane hits the coast the best predictor of the magnitude of property loss is ocean temperature with warmer oceans leading to greater loss amounts [Jagger, Elsner, and Burch 2011]. Strazzo, S, J. B. Elsner, J. C. Trepanier and K. A. Emanuel (2013). “Frequency, intensity, and sensitivity to sea surface temperature of North Atlantic tropical cyclones in best-track and simulated data”. In: Journal of Advances in Modeling Earth Systems 5.3, pp. 500-509. URL: http://myweb.fsu.edu/jelsner/PDF/Research/StrazzoElsnerTrepanierEmanuel2013.pdf. A central tenet of mine is that with greater diversity comes greater creativity so I applaud the efforts of Drs. Tyler McCreary and Sarah Lester to develop a project plan to enhance and support diversity and inclusion in the department. The project will include an independent external evaluation of current practices and offer specific recommendations regarding how to create a more inclusive environment for teaching, learning, and research. Towards these efforts I would like to ask that everyone play a role in the assessment if/when asked. We hope that a rigorous evaluation of current practices with concrete suggestions for improvements will lead to transformational changes in the department in alignment with FSU’s Strategic Plan to increase the diversity of the student body, faculty, and staff. A diverse workforce in the department will lead to a competitive advantage, greater innovation, and new experiences for dealing with the complex problems of today’s world. I’m excited to be back. Of the all the things I did this summer—conference in Greece, touring in Sofia, tornado chasing in Oklahoma—the most rewarding was a two-day NSF program called GEO Opportunities for Leadership in Diversity (GOLD): Hearts of GOLD. Geography is more diverse than the Geosciences but there remains plenty of room to broaden participation. Inclusion begins at home. Agree to respect others. Honor others’ experiences, regardless of opinion or perspective. Take responsibility for and accept the consequences of your words and actions. Respect the foundational belief that equality pertains to all people with no exceptions. Acknowledge that social inequalities exist of which you may be unaware. Unfortunately, as made painfully clear by recent white supremacists violence in Charlottesville and Trump’s racist response, much work needs to be done. The faculty and staff of Geography send out congratulations to our Spring 2017 graduating class. Well done! May is my favorite. A lifetime on the rhythm of school gives May a special place in my psyche. No more grading and classes to prep. A time to reflect on the past and dream about the future. What should I study next? Seemingly endless time to write a paper, finish a grant proposal, start a book. The potential is unbounded, like the weather across the Great Plains ready to explode. So there is where you’ll find me in May reflecting, writing, coding, and watching for the sky to erupt and the year to begin anew. In Bulgaria March 1st is Baba Marta (Grandma March) Day. To welcome the arrival of spring, martenitsi are worn until the wearer first sees a stork or blossoming tree. The red (life and passion) and white (purity) woven threads symbolize the wish for good health. The woven colors also symbolize the need for balance in life. According to Wikipedia there is a similar tradition in Macedonia, Greece, Albania, Romania, and Moldova related to the ancient pagan history of the Balkans and to all agricultural cults of nature. Assign a chance that what you assert is true rather than a chance that your data could be more extreme. The department is hosting a workshop on Bayesian regression models in R this week (Friday). It is a chance to start a conversation with folks in the college interested in Bayesian methods. The workshop will focus on introductory material to get started with the new Stan engine for modeling. The Department of Geography is enriched by the diversity of cultures represented by its students and faculty so I’m deeply concerned about the well-being of those who may be impacted by the policies that have been put in place because of the so-called “Muslim Ban”. The ban is antithetical to all that is America and an affront to all we cherish as a university community. We must resist. It’s been a busy & hectic start to the spring semester: faculty recruitment, overflowing classrooms, and summer budget cuts. And preparation continues on hosting the first Workshop on Bayesian Models in R. We are capacity with 20 registered participants. The workshop will take place Friday, February 24th. Emeritus professor Mort Winsberg has been in and out of the hospital since December. He is resting comfortably at home with care but the prospects of his early return to the department are dim at this time. Please keep him in your thoughts. Finally, keep your eyes on the skies this weekend as severe weather in and around Tallahassee is likely from a powerful storm system moving across the South. November is the time of year when students apply for academic jobs. Which means we as faculty are asked to write reference letters. Despite the time it takes to write a good letter the effort can be enjoyable especially when the student has excelled. Not all letters are the same nor should they be. Unfortunately there can be gender bias. According the the Commission on the Status of Women from the University of Arizona, letters of reference for men are four times more likely to mention publications and twice as likely to have multiple references to research. Be aware of this potential bias, and be aware it’s not only a male problem. Make sure you put critical accomplishments in every letter. Emphasize accomplishments, not effort. Use adjectives emphasizing skills rather than those describing effort. Keep it professional and steer away from stereotypes. Adjectives to avoid: caring, compassionate, hard-working, dependable, diligent, dedicated, warm, helpful. Instead include: successful, excellent, accomplished, outstanding, skilled, knowledgeable, insightful, resourceful, confident, ambitious, independent, intellectual. Sexual harassment is real and pervasive. It traumatizes the victim and reduces the intellectual vitality of the department. Let’s work to make the Geography Department a civil and welcoming place for all. Let’s look back on how the department spent its money during my first year as chair. The data for Fiscal Year 2016 were tabulated by Audrey Nichols our Office Manager and Financial Assistant. She asked me to illustrate the categories using a graph. I decided comparisons are easiest to make using an ordered bar graph. The largest expenditures are faculty and graduate student salaries accounting for nearly two thirds of our budget. Note that the categories of AP, USPS, and OPS are for our staff (Audrey, Alex, and Krystal). I think the university needs to pay its quality staff much better. This is a point of emphasis for me this year. Here is the R code I used to make the graph. Like most geographers I like maps. I remember collecting them as a kid. Not the ones that fell out of my father’s National Geographic magazines but the ones I’d find inside gas stations. Each company would print their own series and it would be fun to try to get as many states as possible. In the early 1970’s they were free; usually arranged in a wire rack near the counter. I grew up in Milwaukee near a busy three-way intersection (Capitol Drive, Fond Du Lac Avenue, 51st Street) with several gas stations in the area. My brothers and I would walk around the neighborhood collecting the latest maps. The Standard Oil maps were my favorite; the red, white and blue banner on the cover with a stamp showing the season and year. I learned about cartography as some maps were easier to read and about scale as I tried to fit adjacent state maps together. And the multi-state regional maps came in handy when I started traveling to frisbee tournaments like the annual “Throw for the Roses” tournament in Iroquois Park, Louisville. With the help of Krystal Vester and Victor Mesev, I’ve taken Mort Winsberg’s chronology of faculty in the department since 1925 and updated it to the present. According to Mort “Geography first appeared in the 1925-26 catalog of the Florida State College for Women, having been taught in the 1924-25 academic year.” Four courses in geography were offered in the Department of History and Geography. The first person with a geography degree in that department was Martha Stolfus. Last month I organized the 10th annual Tally Rally frisbee tournament featuring top players from around the country including as far away as Wisconsin, Alaska, California, and Virginia. The game is officially called Double Disc Court, but informally we call it `Escape.’ The game is played like doubles tennis except that there are two discs and you and your teammate need to avoid getting caught with both discs at the same time. See https://youtu.be/nszaRylOxus for more details. But the point here is to demonstrate how to create line graphs in R without legends. Starting with an initial seeding of players the tournament proceeds in rounds with players moving up or down in ranking according to how well they perform. A graph of the rank by round provides a rank trajectory through the tournament by player. Perhaps you can use graphs like these? See http://rpubs.com/jelsner/SpringEscape. I don’t know what I would do without her. Ms. Audrey Nichols is an exemplary employee providing consistent service excellence as office manager in the department of geography. Since her arrival in 2014 she has shown a continuous attitude of excellence in service. According to the FSU Controller’s office the compliance rates on budgetary manners under Audrey is now averaging above 90% on a monthly basis. In fact for the fiscal year 2015 the geography department’s compliance rate was 99%. This is up from 67% on an annual basis before her arrival. The rate varies by month but it has generally been above that achieved by the college’s administrative unit. She serves the faculty and staff in the department with a positive attitude and demands excellence from her subordinates. Her attention to detail is deeply appreciated. She shares generously of her time providing an outstanding example of diligence for faculty, staff, and students. Audrey has single-handedly changed the research culture of the department through her efforts in helping faculty with proposals and grant-related matters. Over the past few months she has worked tirelessly with the folks in immigration to secure the needed paperwork for our newest faculty hire from Canada. Thank you! A source of pride for me as chair of this department is our culture of coding. We code to analyze data, create maps, and draw inference. As a graduate student in the 80’s I was trained in FORTRAN but statistics were always easier with SPlus. Hassles with annual licensing made it hard to use it for teaching. I tried SPSS for a semester but all the pointing and clicking made it tedious for students. I started coding in R about 15 years ago and I’ve never looked back. It’s better to teach what you use. R is free and open source. So is Python. Most students I know like this. They learn R in Quantitative Geography and put it to use in Applied Spatial Statistics. I now teach ggplot (R package for plots) in my undergraduate courses, including those online. I’m glad to see that Python is also being taught. Not all geography is quantitative but what is benefits from code. Since becoming chair of the department I’ve been thinking about sexual harassment a lot. Just like I did nearly 20 years ago. Then a young faculty in my former department was handed a dismissal letter after her first semester on a tenure-earning line. I demanded to know why. The chair, supported by the dean and many of the senior (read: powerful) faculty, eventually claimed she lacked collegiality. I said WTF. She was fired and I left for Geography. Sexual misconduct is real and pervasive. When it occurs it often involves powerful males and their female students or junior colleagues. It is unethical. It impedes equal opportunity. It traumatizes the victims and reduces the intellectual vitality of the department. Let’s respect the dignity and worth of each individual and work to make our department a civil and welcoming place for all. The front office has a new mail sorter. Thanks to the hard work of Audrey and Krystal the staff is now set to sort your daily mail more efficiently. The sorter has extra desk space so you can grab a donut (or other sweet) as you pick up your latest copy of the Annals. According to Academic Analytics (vAAD2013.10.464) the Department of Geography at FSU ranks number one (out 100 geography departments in the country) in percentage of faculty with an article and the percentage of faculty with a citation. It also ranks 7th (94th percentile) in the number of articles per faculty member and 19th (82nd percentile) in the number of citations per faculty member. I’m interested in comparing departments within the college based on metrics of productivity. There are many ways to do this but here I examined the SRAD (Sponsored Research Administration Distribution) per faculty. I obtain the annual numbers from https://www.research.fsu.edu/research-offices/sra/about/srad-distribution-reports/ I then ran the following code.